The Xing MP3 encoder was created, seemingly from scratch, by the Xing Technology Corporation with a primary goal in mind: creating a very fast encoder. And it delivers! It is much faster than other encoders in benchmark tests, even compared to famously fast encoders such as Musepack, Gogo and Ogg Vorbis Lancer. These speed gains are obtained mostly with heavy usage of x86 assembly code (which, in this case, is unfortunately limited to the Windows platform). What about quality? Surprisingly, the quality is quite good! Of course not on par with LAME, but if you are in a hurry, Xing can be a good choice as it is several times faster. Xing also created players, and they are available at the XingSound page. 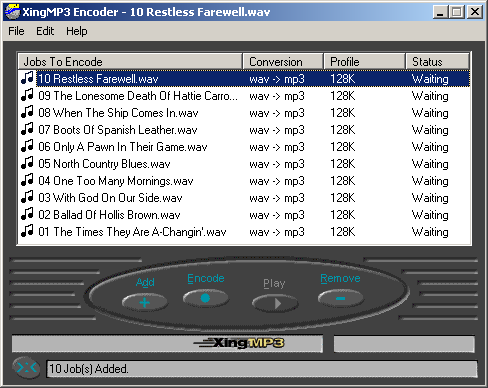 Xing Technology was acquired by RealNetworks in the early 2000s (but you can still check their web site at the Internet Archive, here), and the MP3 encoder was renamed to Helix MP3 Encoder. Then, in 2005, they released the sources under an open source license. It seems they closed the sources again, but here you can find compiles of their encoder made while they were still open, as well as the source code.